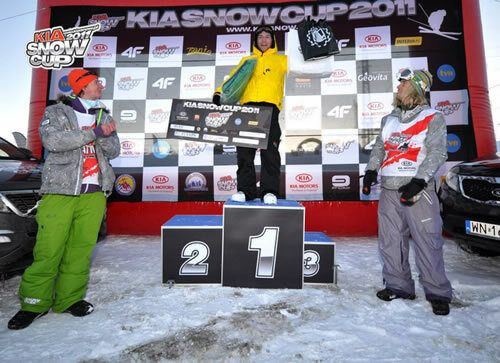 2011 KIA Snowcup Rail Jam WON by Sunshine World Pro Team Member, Mikey McKernan in Bialka Tatrzanska, Poland! What an amazing couple of days for the Sunshine World Instructor Training Academy and 3Ryde Pro Team. The last two days have seen 3Ryde Pro Team and Sunshine World Instructor Academy Members: TJ Alty, Mikey McKernan, Ben Pocklington, Greg Calcutt, Ben Tricarico, Alan Garcia, Matty Alder, Graham Blakeley, Joe Marples, Charlie Swan, Rienk Alting and Adam Ward entering the KIA 2011 Snowcup in Bialka Tatrzanska. 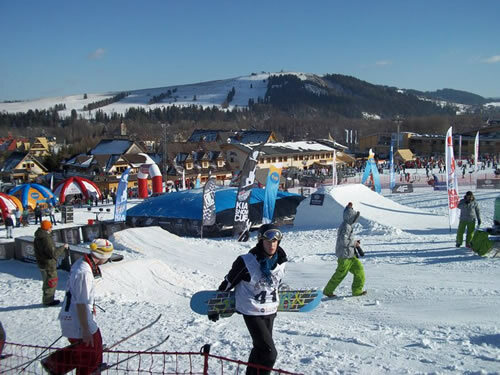 Day 1 was the Rail Jam and some awesome moves were thrown down by more than 30 competitors on skis and snowboards. Our own man Mikey McKernan won the day ahead of his fellow team mates and all the other competitors with some extremely ballsy, yet highly consistent moves displaying great skills both regular and switch and for front side and backside boardslides. Photo Above: TJ, another Sunshine World Pro Team member who busted out some sick moves in the Rail Jam. Photo Above: One of Mikey's winning grinds was a 180 on to switch 50/50 grind to 180 on the transition to 50/50 grind to 180 off! All stomped to perfection! Day two saw the final of the Big Air competition. Huge flips, spins, grabs and airs were performed by the Sunshine World Academy Members and 3Ryde Pro Team alike. Snowboard Academy member, Ben Tricarico, was going huge attempting double corked front and backflips and even managing to get some solid grabs in too! 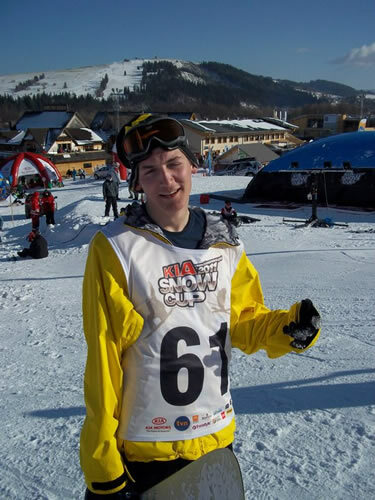 3Ryde Pro Team Sponsored skier, Greg Calcutt, nailed about 8 backflips over the two days! 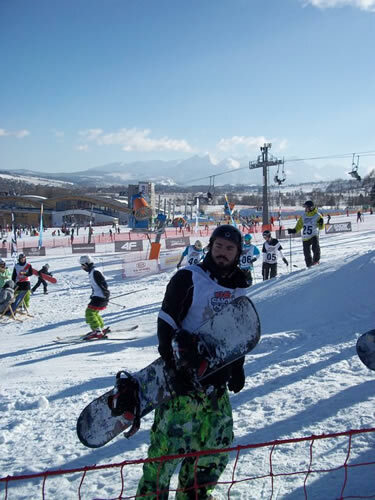 Our Managing Director, Al, threw caution to the wind after injuring his back in the Rail Jam the previous day and landed a huge Switch Backflip and a solid regular backflip with crossed skis- all with a broken leg! What awesome training on the Big Air bag and loads of new friends from around the world- especially from Poland of course. 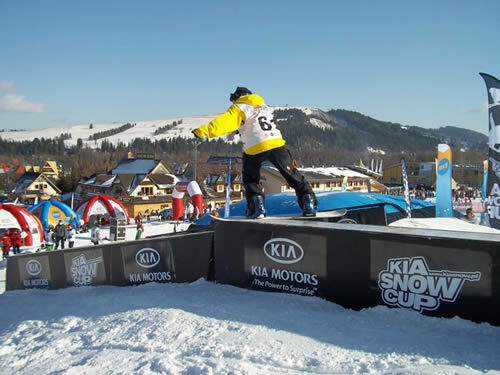 HUGE thanks to the organisers of the KIA Snowcup- the KIA Pro Team members and the Snowcup staff. Shout out to the AWESOME DJ who seamlessly blasted out endless sick D&B tunes all day! Big love to everyone who was involved! And best of all we all managed to walk away without any serious injuries- BOOM!